Mushroom Burgers, from Thyme for Cooking's Weekly Menu Planner. 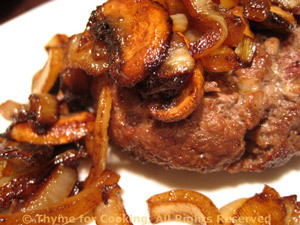 Flavorful burgers, filled with chopped mushrooms, are served with sautéed mushrooms and onions. We normally eat burgers with a fork and a glass of red. Feel free to have them on a bun with a Mountain Dew. Finely chop 1oz (30gr) trimmed mushrooms. Combine mushrooms, 2 tsp Worcestershire sauce, garlic powder, 1/2 tsp paprika and beef. Mix well. Form into 3 or 4 patties. Cook on barbecue grill over direct heat for 3 - 5 minutes per side, using a basket, grill pad or pan if you have one, it's easier. Heat 2 tsp oil, 2 tsp Worcestershire sauce and 1/2 tsp paprika in a medium nonstick skillet over medium heat. Add mushrooms, onions and sauté until nicely glazed, stirring and turning frequently, about 10 minutes. Spoon sautéed mushrooms and onions over burgers and serve - on a bun or not. 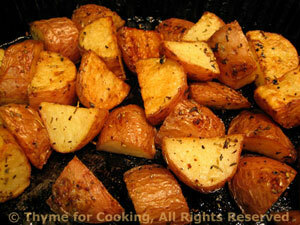 Simple, grilled or roasted potatoes are perfect with equally simple, grilled meats. 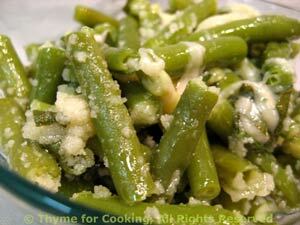 Vary the herbs, Worcestershire, etc. according to the rest of the meal. Put them into an old metal pie plate or cake tin or foil barbecue container (or whatever) that you will never use for any purpose but the barbecue again... and you should have one of these. Cook on barbecue (grill) for 25 - 30 minutes or until done... and you will need to stir them with a long-handled wooden spoon occasionally as they tend to develop 'hot spots' and can get a little crispy.